Let’s admit one thing; golf is a game that keeps you coming back for more. It’s a continuous journey in pursuit of improvement.You are not alone in this, even the pros constantly seek to improve their game; they aren’t resting on their oars.Many amateur golfers often ask a host of questions like: how do I improve my golf swing technique? How can I reduce my golf strokes? How can I hit my ball straighter? How can I improve my golf swing plane?Some players even go as far as purchasing golf swing improvement products rather than learning more about the game and practicing. Golf trainers and PGA professionals, on the other hand, are constantly trying to find better and easier ways to improve various aspects of the swing.Golf may not be a game of perfection (no one knows it all) but that doesn’t mean you can’t implement perfect golf swings every now and again.You can do this with consistent practice and mastery of the golf swing plane. Swing plane is frequently confused with a ball swing path.During a swing, the club head moves in a particular direction and the arc on which it travels is what is referred to as swing path. Swing plane is a technical term that describes the angle of club shaft movement around the golfer’s body in proportion to the target (from the back swing to the downswing). Simply put, swing plane is the pathway the club shaft takes during the back swing and the down swing as you attempt to strike the ball.When you address the ball, this angle is the plane your club is expected to stay on all through the duration of the swing. How to improve golf swing plane depends on a certain factor. If you are able to pull off a good swing plane, you are said to be on-plane and if not, you are off-plane. Consistently hitting the ball correctly depends on your stance at an address, adequate knowledge of the fundamentals of the game, proper weight transfer on the swing and having the right golf swing plane.To improve your golf swing and ultimately improve your golf game, you have to improve your golf swing plane.These Handy Tips for Improving Golf Swing Plane will perk up your game by helping stay on-plane. A player’s posture and the distance maintained from the ball at address are the major factors responsible for great swing planes. Proper alignment is,therefore, akey to achieving straight shots. Poor balance during the swing is one common difficulty most amateur golfers face. It alters the swing plane and results in weak shots or mis-hits. So to stay on-plane, maintain a good balance. To score a winning swing plane, your left elbow should be parallel to the target and not your feet.A practice tip to help improve your swing plane is to place a coin close to the tip of your left foot; the coin should remain where you left it at the end of the swing. This drill can be done in your backyard without a trainer. To stay on-plane,ensure that you finish with your abdomen towards the ball and your body mass effectively transferred over the curve of your front foot. This simple but helpful tip will extremely improve your swing plane. Playing golf involves both your physical and mental output. Both are relevant aspects of your golf swing mechanics. Whatever spells ill for one, spells ills for the other. If you have tensions in your muscles and nerves or you are stressed out, it will affect your rounds of golf negatively. You do not want your nerve sending wrong messages to your brain that will reflect on or jeopardize your game. You may also wonder how to get better golf scores. Built-up tension and stress will affect your stance and you can say goodbye to the lower scores.The key to overcoming this lies in consistent golf swings; getting consistent and accurate swing is closely tied to being on-plane. It may not be your intention to become the greatest golfer that ever lived. Nonetheless,it won’t hurt for you to play better golf and lower your score. Ultimately, a relaxed golferwill overcome tendencies to slice and other mis-hits.One way to release tension is to breathe as you swing. 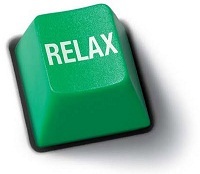 Plus, the whole essence of pre-game workouts to improve golf game is to eliminate stress and tension. 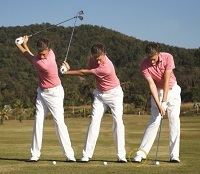 Exert and maintain the same pressure orgrip on your club all through the backswing, downswing and the follow through. 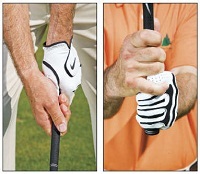 Your grip should not be too hard, but strong enough to prevent the club from slipping out of your hands.On a scale of one to ten, try to maintain a three or four. With a good grip and control of the club and proper swing plane, you’ll be able to get that crisp, solid shot.Note that the club face should be square at impact. You have better chances of keeping the club face square if the shaft of the club is pointing towards the target.If you feel the need to utilize the services of a golf swing trainer, do so.But of course, there are a lot of club drills you can do from the comfort of your home. During the colder months, you can still practice regularly to improve your golf game at home. Weight transfer on the downswing is as important as gaining a good stance. Remember to shift your weight from right to left on the downswing. For the reverse pivot, weight is supposed to transfer to the left on the backswing and right on the downswing. Achieving an on-plane swing is a vital part of the game.For right handed golfers, when your left elbow points at the ball halfway during the downswing, you are on-plane. You need the proper golf swing technique to execute swings that consistently achieve desired results. Hands, arms, and shoulders must work together in order to achieve this. A full shoulder rotation and correct rotation of the hips will cement the fate of the ball in flight.Both will determine if the ball will achieve the desired yardage or not. Additionally, you can acquire fitted golf accessories. A lot ofsome golf swing plane training aids are availabletohelp you improve your golf swing plane.One such golf improvement accessory is the GSRN’s Timing Improver. This training aid helps in improving your swing, timing and swing speed.